The history of the Easter egg varies, depending on the historian. One story tells about the Roman Empire when people believed in many gods and how they obtained favors from them. The Spring Goddess Ostara or Eastre was worshiped and honored by offering her baskets of colored eggs, and it is also said that her favorite pet was a hare. During the early Christian era, and particularly during the time of Charlemagne (800-814 AD), Lent was observed by abstaining from eggs. This practice lasted until 1784. During the time of Lent all eggs that were collected from the hen houses had to be kept either for hatching, or were kept safely to be eaten at Easter. To be kept edible for several weeks the eggs were dipped into melted mutton fat or wax. At Easter they were then decorated to make them more attractive. According to folklore these pretty eggs were given to children, because it was a pleasant and enjoyable way of getting rid of the surplus. It was always felt that “A pretty egg tastes better” and as time went on through the ages eggs began tasting even better when they were made from chocolate. Today I imagined I lived in the age of Charlemagne and was preparing to give gifts to the Goddess Eastre to obtain from her some special favors……I will not tell you my secret wish, but will tell you how I will entice this beautiful goddess to look upon me favorably. 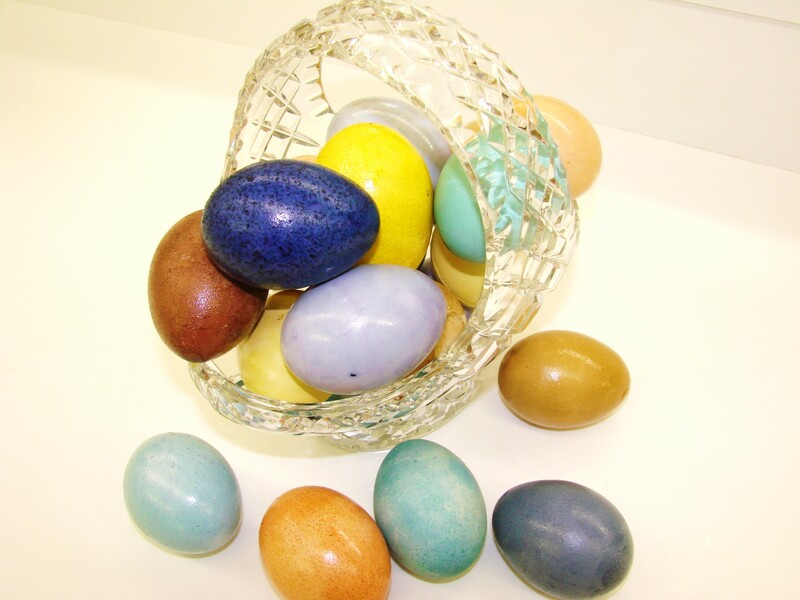 I will beguile her with a gift that she would love most……..a basket of colored eggs. Several days ago I stated to collect onion skins, and red cabbage leaves. However, as I pretend to live in another era, yet live in the 21st century, I went to the freezer and found frozen blueberries, and in the pantry Instant coffee and Turmeric which give nice colors to the eggs. A bottle of Burgundy that went slightly bad in my non-refrigerated pantry, heavens… it was not stored in the wine cellar……..will give me a nice deep brown color. Oh, yes, I also found packets of Raspberry Herbal Tea……and wonder what that color would be? It was a deep, pretty gray that reminded me of a dove. First step is to boil the WHITE eggs……..you have to use white eggs only…… Wash them in some sudsy, warm water to get any oils off that may have stayed on them before they were packed into the cardboard egg carton……..and rinse them well with cool water. I like to poke a little hole – with an egg poker – to ensure that they do not break while cooking. One can get that little gadget either in the grocery stores on the gadget wall or any kitchen store. Proceed with your favorite method of cooking hard boiled eggs. When cooked placed them into iced water to give them a quick cooling which helps with removing the shells more easily. 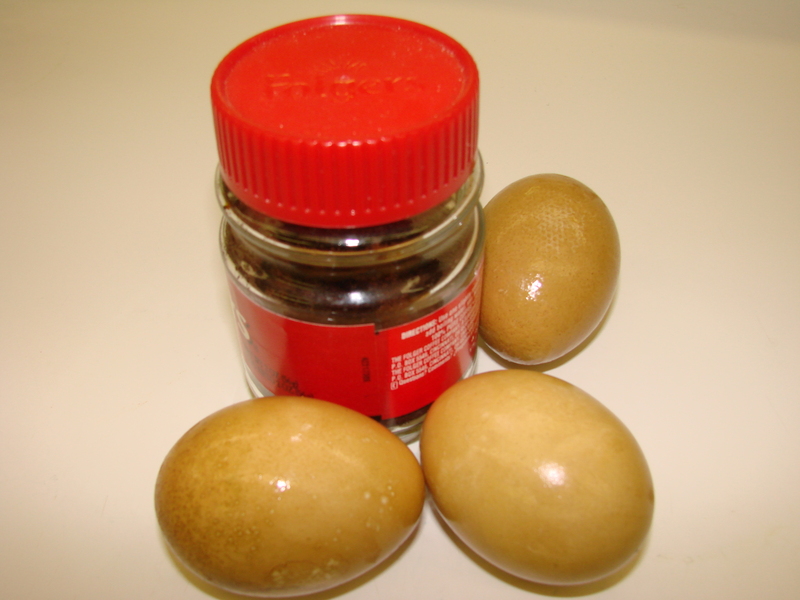 This you can do a day ahead and refrigerate the eggs……..
Note……use only stainless steel pots….enamel or china will be discolored with these dyes…..one can use glass containers/bowls or glass coffee cups……..
Bring this mixture to a boil and add your eggs, remove from heat and let the eggs be submerged for about 1 hour or longer. 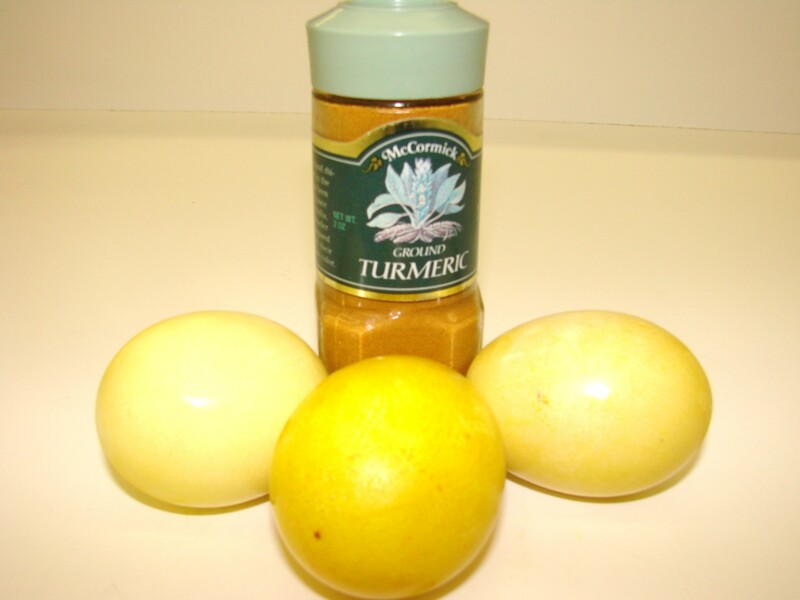 The longer you keep the eggs in this dye the deeper the yellow color will be…. Rinse the eggs with cold water to remove any spice particles. 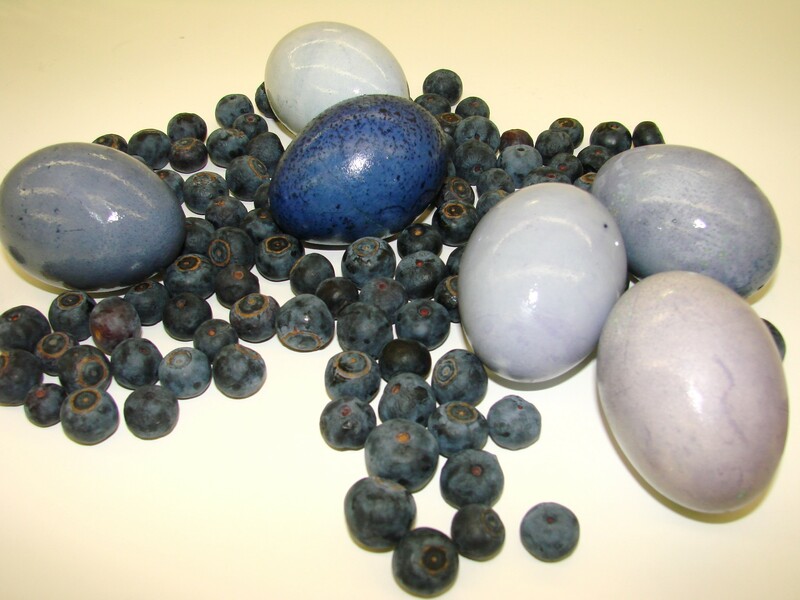 Pale blue to deep blue and purple eggs with Blueberries…..
Brown eggs with Instant Coffee……. 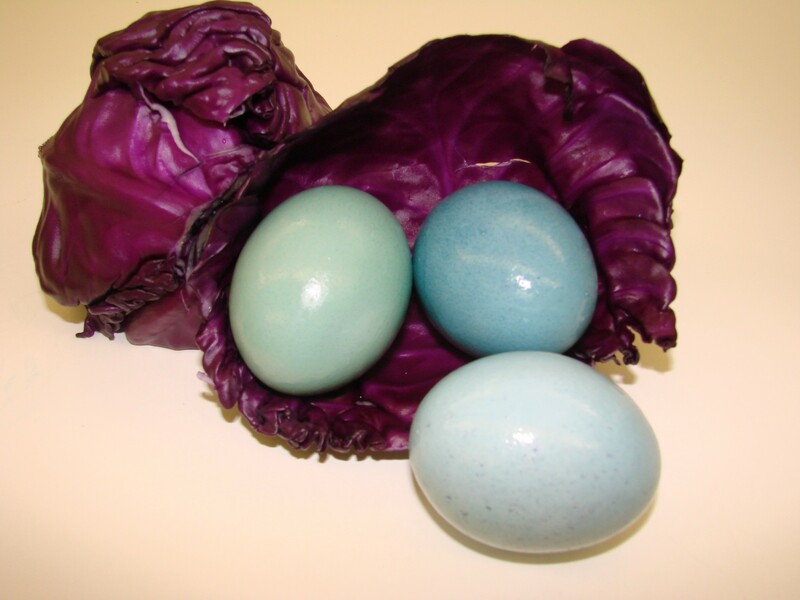 Red Cabbage leaves for Robin’s Blue eggs…. Place about 2 cups of chopped red cabbage leaves into a stainless steel 2 quart pot add water to cover the leaves. Bring them to boil and simmer for about 30 minutes or longer, until the cabbage is pink in color and has released just about all the color. Strain the liquid into a glass bowl or cup and place the egg into the dye….let it be immersed for about an hour……or longer. Check periodically for the color intensity….if you like a light blue color on the egg take it out earlier if you like the blue color be darker……keep it in the dye longer…..it is your choice. Onion Skins for a nice pinkish/brown color……. 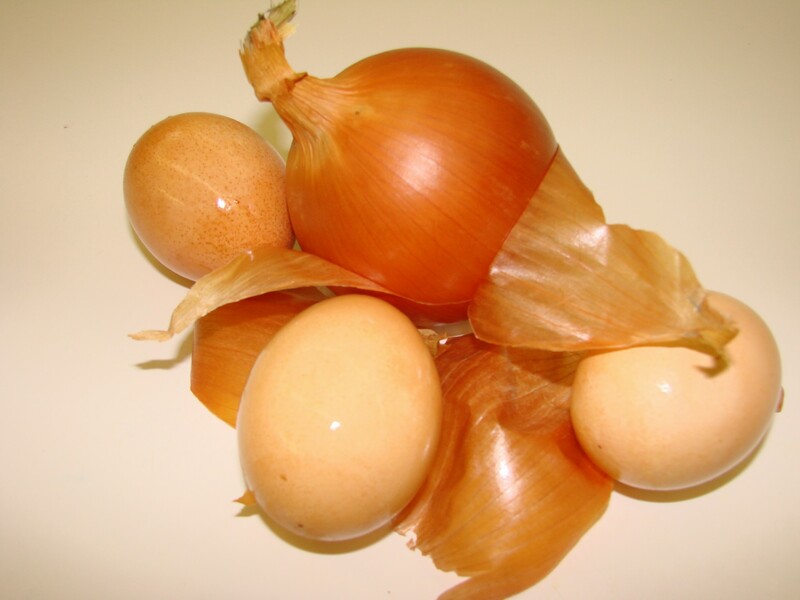 You will need about a cup of packed onion skins to make a deep enough dye to color your eggs……. Place 1 cup of packed onion skins into a stainless steel 1 quart pot and add enough water to cover the skins. Bring them to a boil and let them simmer for about 30 minutes or longer….making sure that the water does not totally evaporate……..if the water level reduces add more water to cover the onion skins. When the color of the dye is a deep brown strain it into a glass cup, and add the hard boiled egg Keep the egg in that dye for about an hour or more…….the longer you keep it submerged the darker the color will be. I like them lighter in color…..with less time they come out almost a pinkish brown color. A drop of olive oil in your palm………. 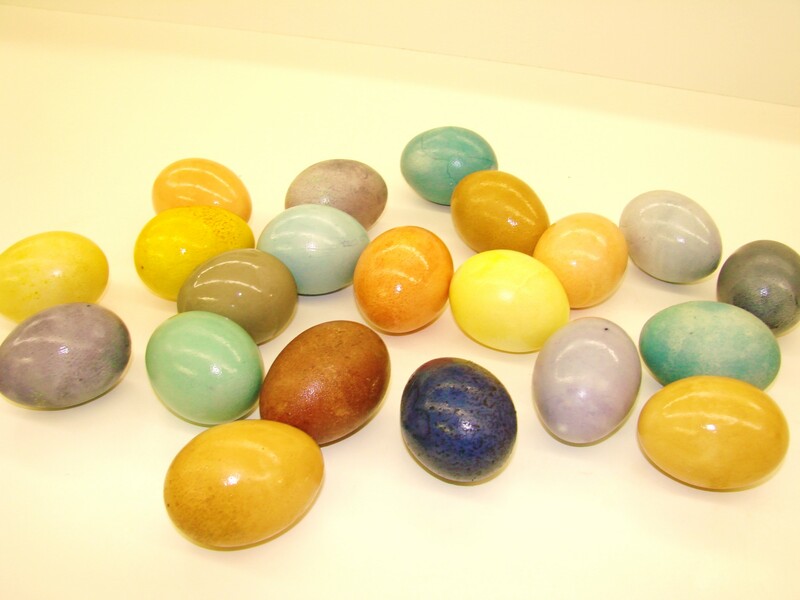 When all the eggs are dyed and dried………place a little oil into the palm of your hand and rub it into your hands Now pick up every colored egg and oil them to make them shine………. You need just a small drop of oil……do not make them too greasy. 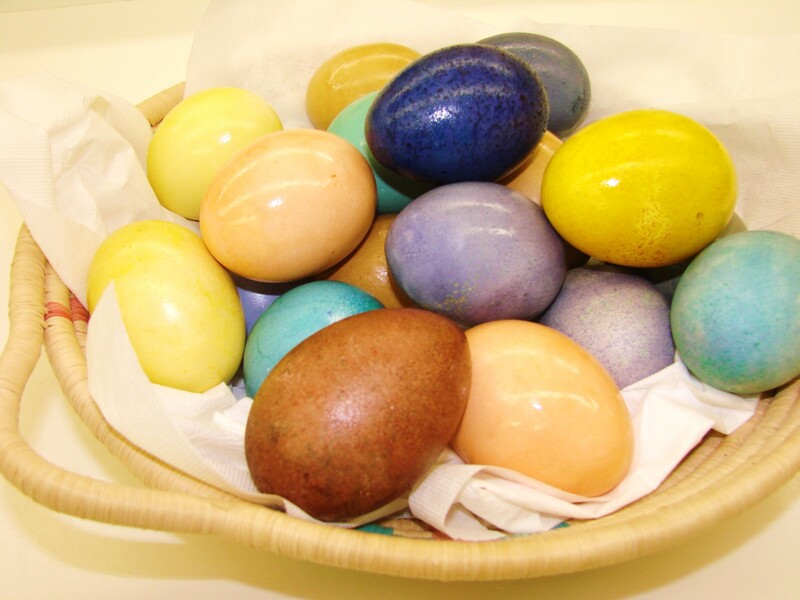 Here is my basket of colored eggs for the Goddess Eastre………who will hopefully bestow favors upon me and grant my secret wish! Lovely post, Maria! Searching for sources of natural dyes made you especially creative. Once I had a Latvian roommate, Betita Vinklers, who taught me to make Easter eggs as they do in her country. You take a 6-inch square of muslin, lay some onion skins on it, and then lay an uncooked egg on top. Wrap the onion skins and muslin around the egg and secure it tightly by wrapping all around with thread. Boil the egg for ten minutes, and let cool. When you unwrap the egg package, you’ll find that the string pressing against the onion skins has created a pretty pattern on the egg, reminiscent of batik.